Last week I helped a family member prep his house for sale (update 8/10 — it’s now sold). I had done some stonework there a few years ago, so to prep it now we just added some sod and mulch. 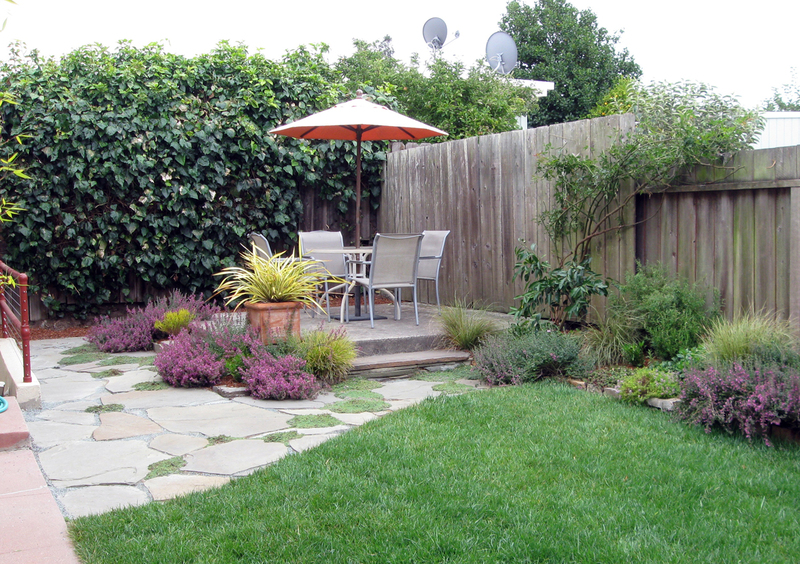 The house is in Albany with one of those tiny East Bay backyards, really easy to work in; I think family members should all be encouraged to have really small yards. The flagstone here is Connecticut Blue, a sandstone which is not always from Connecticut and only sometimes looks bluish. It gets sold in a lot of different shapes and thicknesses out here, popular for creating that East Coast bluestone look. We tend to use it when we want to blend in with existing concrete and not put that concrete to shame. In this case, we wanted to make the massive former hot tub slab look like an integrated part of the yard, rather than just a massive former hot tub slab. We also wanted to make the massive wall of ivy into something other than a massive wall of ivy, but that phase never happened, a project for the future owners, I guess. 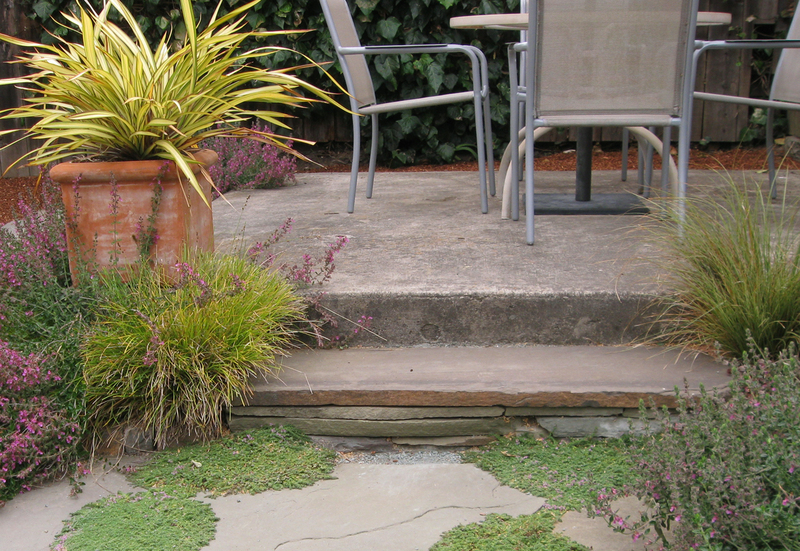 When you factor in the embedded energy and the $500/ton price tag, I’m not sure Connecticut Blue is all that much better than just using recycled concrete/urbanite for a patio, but there’s no question the stacked flagstone makes a much nicer step. I like the Connecticut Blue in the hellstrip with the gold path fines. We used blue path fines for the joints of the patio, and in retrospect it would have been better with the gold. The blue has a tendency to leave little gravelly bits on the stones, not nice for bare feet. All of the stone is leftover from a much larger job; instead of throwing it away or selling it on Craigslist, I used it here. Some of the stone in the raised bed was too thin to dry-stack, so I mortared it with a hidden joint so it would look dry-stacked but still be solid. Other parts of the wall, using the larger stones, are actually dry-stacked, but no one can tell the difference. 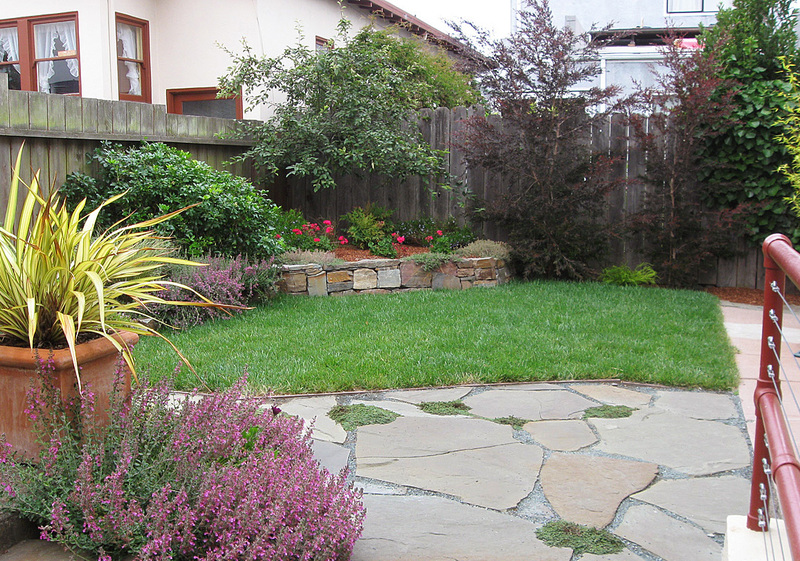 All the stonework and most of the plants went in three years ago, so the main thing we did to get the yard ready was to add sod. I spend a lot more of my time taking out lawns instead of putting them in, but lawns do have their merits and sometimes you gotta just throw down some sod. 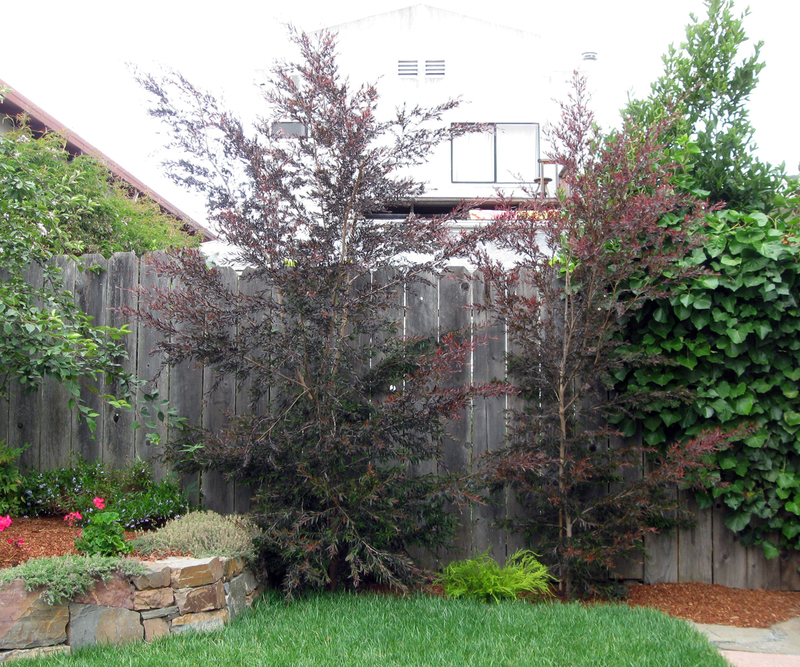 The Leptospermum ‘Dark Shadows’ were planted as 1 gallons three years ago. Pretty fast. 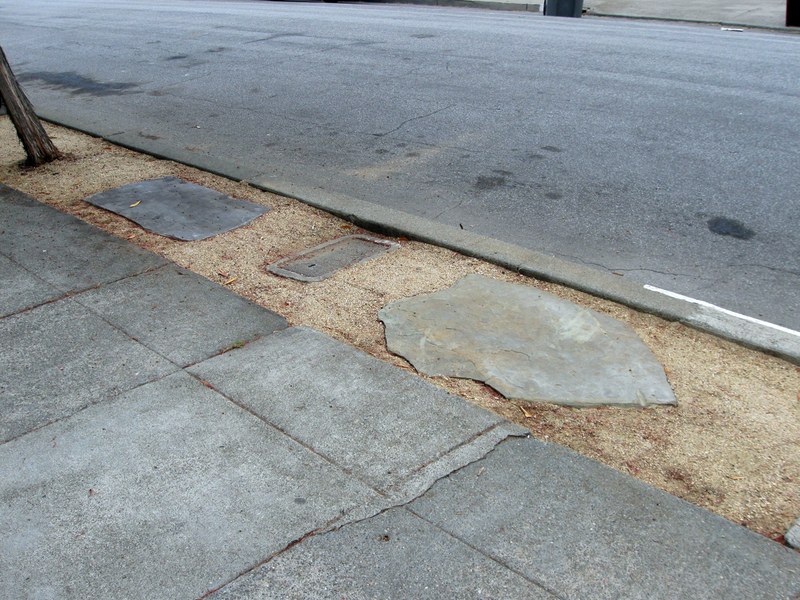 And just to compare with the Connecticut Blue in path fines, a photo of recycled concrete/urbanite in path fines from a different project, the closest comparison I have. This entry was posted on Thursday, July 29th, 2010 at 10:01 am and is filed under flatwork, private gardens, stone. You can follow any responses to this entry through the RSS 2.0 feed. You can leave a response, or trackback from your own site. Kind of hard to tell from the pictures, but the urbanite doesn’t look half bad. 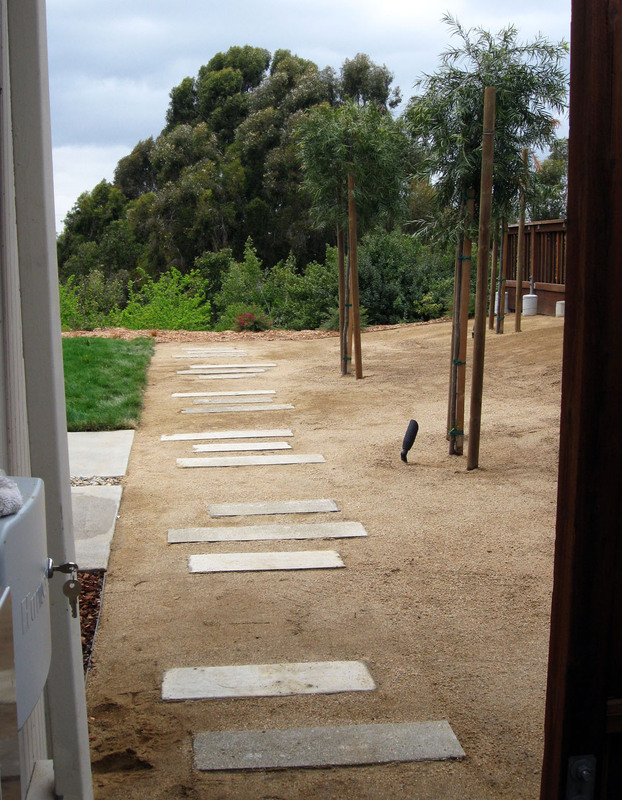 I have a friend who has a similar urbanite path, with the urbanite stained different colors, and it looks really good. Then again, the bluestone is very nice with the fines… Ah, never mind. I don’t know which one I like better.